Adair Turner became chairman of Britain's Financial Services Authority just as the global financial crisis struck in 2008, and he played a leading role in redesigning global financial regulation. In this eye-opening book, he sets the record straight about what really caused the crisis. It didn't happen because banks are too big to fail--our addiction to private debt is to blame. Between Debt and the Devil challenges the belief that we need credit growth to fuel economic growth, and that rising debt is okay as long as inflation remains low. In fact, most credit is not needed for economic growth–but it drives real estate booms and busts and leads to financial crisis and depression. 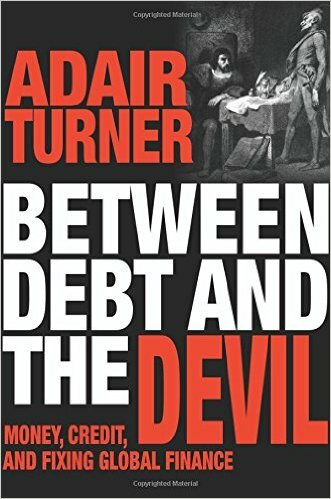 Turner explains why public policy needs to manage the growth and allocation of credit creation, and why debt needs to be taxed as a form of economic pollution. Banks need far more capital, real estate lending must be restricted, and we need to tackle inequality and mitigate the relentless rise of real estate prices. Turner also debunks the big myth about fiat money–the erroneous notion that printing money will lead to harmful inflation. To escape the mess created by past policy errors, we sometimes need to monetize government debt and finance fiscal deficits with central-bank money. Posted in The Library by Paul Dixon on January 11th, 2017.